Turbosmart 12 PSI Internal Wastegate Actuator for all 2016, 2017 and 2018 Focus RSs. The stock wastegate in your 2016-2018 Focus RS isn't letting your RS reach its full potential, even when it's at standard boost pressures. But did you know there's a great way to improve your RS' responsiveness and performance? A way to get faster boost build-off and less drop-off at higher RPMs? Take a look at this internal wastegate actuator from Turbosmart, available from CJ Pony Parts! This Turbosmart 12 PSI Internal Wastegate Actuator (TS-0622-9122) will give you a more responsive and stable boost curve than your OEM wastegate actuator. Your OEM actuator uses softer springs, and they tend to open before your Focus' peak boost is reached. So what does that mean for you? You don't get all of the boost you could be getting! 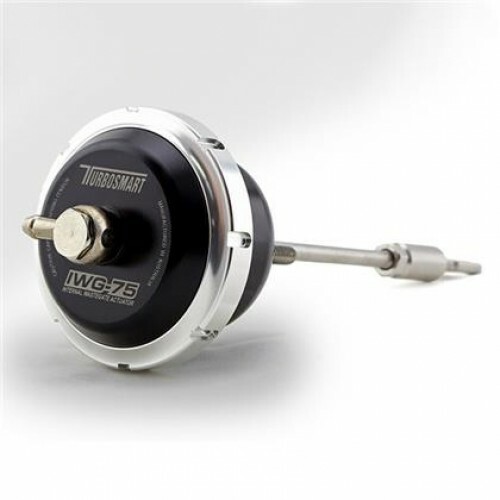 Thankfully, Turbosmart offers this 12 PSI-rated internal wastegate actuator that's specifically designed for performance and reliability while offering dramatic improvements to your Focus' responsiveness and performance, especially in the mid-range. This internal wastegate actuator offers sturdy billet construction, and it's rigorously quality-tested by Turbosmart to make sure it's reliable and will perform like it should. And one of the best parts about this wastegate actuator is its locking collar design. This means you can easily do quick spring changes any time you want to tune your Focus RS for an increase in boost!